What explains Harper’s slavish support for Israel? Pro-Israel politicians regularly claim their position is a defense of the Jewish community. Its rare when they say their goal is to mobilize those who believe a Jewish “return” to the Middle East will hasten end times or that Israel is a prized ally as a heavily militarized “white” outpost near much of the world’s oil. Last Fall Al Jazeera’s Fault Lines investigated Stephan Harper’s one-sided support for Israel. Widely disseminated in pro-Palestinian circles, the Avi Lewis narrated TV program effectively highlighted the divide between Canada’s pro-Israel government and growing grassroots support for Palestinians. But, by focusing entirely on Jewish organizations, Fault Lines left the viewer with the impression that Harper’s pro-Israel policy is simply designed to placate the mainstream Jewish community. Many Canadian supporters of the Palestinian cause seem to support this view that Harper’s over-the-top support for Israel is driven by ethnic politics. But the numbers don’t add up. First of all, there are about three times as many Muslim and Arab Canadians as Jews. Just over one per cent of the population in the 2006 census, 315,120 Canadians, identified their origin as Jewish, either alone or combined with another ethnicity (the actual number of Jews is slightly higher but religion is counted every other census). Jews were the 25th largest group defined by ethnic origin, and only in a handful of electoral ridings are they a significant minority of the electorate. Of these ridings, just a couple have competitive races. While it’s true that Jews have high levels of political engagement, are well represented in positions of influence and are a relatively prosperous minority group, the importance of supporting Israel can easily be exaggerated. In fact, historic voting patterns suggest few Canadian Jews vote based on Ottawa’s policy towards Israel. While this may have shifted slightly in the most recent election, historically there is actually an inverse correlation between pro-Israel governments and Jewish support. Pierre Trudeau and Jean Chretien, for instance, garnered more support from the Jewish community than Brian Mulroney. Yet Mulroney was more supportive of Israel than Trudeau and Chretien. The truth is pro-Israel Jewish lobbyists appear influential because they operate within a favourable political climate. They are pushing against an open door. How much power they really have can be seen when they confront an important source of power. There have been two major instances when that has taken place. In 1979, at the instigation of Israeli PM Menachem Begin, short-lived Conservative Prime Minister Joe Clark announced plans to relocate the embassy from Tel Aviv to Jerusalem, effectively recognizing Israeli sovereignty over the city. Arab threats of economic sanction pushed the CEOs of Bell Canada, Royal Bank, ATCO and Bombardier, which all had important contracts in the region, to lobby Clark against making the move. An embarrassed federal government backtracked, more worried about an important sector of corporate power than the pro-Israel Jewish lobby. Similarly, in 1956, when Israel invaded Egypt along with Britain and France, Canada helped undermine the aggressors, by siding with the U.S. Fearing the invasion would add to Moscow’s prestige in a geo-strategically important region, Washington opposed it. Moreover, the rising world hegemon wanted to tell London and Paris that there was a new master in the Middle East. In helping to establish a U.N. peacekeeping force to relieve the foreign troops, Ottawa chose to side with Washington, not the pro-Israel Jewish lobby. Rather than “Jewish votes” Harper’s “Israel no matter what” policy has more to do with mobilizing his rightwing, evangelical base on an issue (unlike abortion) that the government believes has limited electoral downside. While a cross section of Protestants has long supported Zionism, backing is particularly strong among evangelicals who believe Jews need to “return” to the Middle East to hasten the second coming of Jesus and the Apocalypse. In addition to mobilizing some evangelicals and Jews, Harper’s affinity for Israel is also motivated by that country’s militarism. Conservative leaders are impressed by the large political, cultural and economic role Israel’s military plays in the country’s affairs. In recent years Canada-Israel military ties have grown rapidly with both countries top generals and defence ministers visiting each other’s countries. At the same time there has been an increase in weapons sharing and relations between arms manufacturers in the two countries have grown considerably. (For details see Kole Kilibarda’s Canadian and Israeli Defense —Industrial and Homeland Security Ties: An Analysis). Historically, Canadian support for Israel has largely mirrored different governments’ relations to the U.S. Empire. The federal governments most enthralled to Washington, Mulroney and Harper for instance, have been Israel’s biggest cheerleaders. 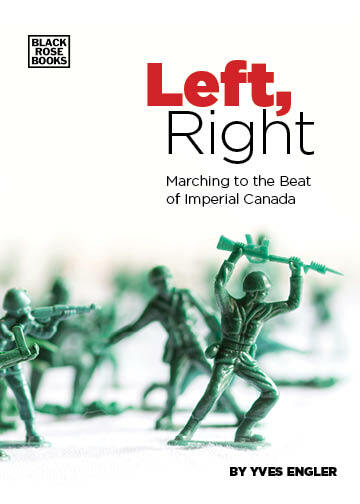 Canadian policy towards the Middle East has generally been designed to enable U.S. imperial designs on a strategic part of the planet. And Ottawa’s longstanding support for Israel has been based on the idea that it is a valuable Western military outpost. External Affairs Minister Lester Pearson, a staunch supporter of Israel and leading foreign policy decision-maker for decades, explained this thinking in a 1952 memo to cabinet: “With the whole Arab world in a state of internal unrest and in the grip of mounting anti-western hysteria, Israel is beginning to emerge as the only stable element in the whole Middle East area.” Pearson went on to explain how “Israel may assume an important role in Western defence as the southern pivot of current plans for the defence” of the eastern Mediterranean. Politically, culturally and economically dependent on North America and Europe, Israel is a dependable Western imperial outpost in the heart of the (oil-producing) Middle East. Due to its Jewish/’White’ supremacist character Israeli society is overwhelmingly in opposition to its neighbours, heightening its geopolitical reliability. In all other U.S.-backed Middle Eastern countries, for instance, the population wants their government to have less to do with Washington while Israelis want closer ties. Recent developments in Colombia may help illustrate this point. For most of the past decade Colombian President Alvaro Uribe acted as a U.S.-backed bulwark against the rising tide of support for a left-leaning Latin American integration that was sweeping South America. But, recent events suggest this dynamic may be coming to an end with Uribe’s successor, Juan Manuel Santos. Colombians simply have too much in common with their neighbours (be it language, history, culture) so the new government has begun to reorient the country’s regional policy against Washington’s wishes. Colombians “South American character” makes them unreliable long-term allies. In contrast Israeli’s European and North American colonial character is seen to make them reliable. The power of empire has tilted Ottawa towards Israel and until there is a significant source of power in Canada (or internationally) backing the Palestinians it is likely to stay that way. Social justice, humanism and morality rarely motivate Canadian foreign policy. Instead, power is what drives foreign affairs and Palestinians have never had much of it. Long under Ottoman rule, then British control after World War I, the Palestinians were an oppressed and relatively powerless people. Palestinians also had the misfortune of living on land claimed by a predominantly European political movement: Zionism. Historically, Ottawa has sided with colonial powers and opposed national liberation struggles. Canada opposed calls for the withdrawal of Dutch troops from Indonesia in the late 1940s. For decades Canada supported British colonialism in Africa while throughout the late 1950s it sided with France against the Algerian liberation movement. Into the 1970s, Ottawa backed Portugal as it waged a colonial war against the people of Angola, Mozambique and Guinea Bissau. It took decades of struggle within Canada — and a shift in the international climate — for Ottawa to withdraw its backing for the apartheid regime in South Africa. Considering this history, it’s not surprising that Ottawa opposes the Palestinian national liberation struggle. To focus on the Jewish lobby is to downplay Canada’s broader pro-colonial, pro-empire foreign policy. It is a mistake to view Ottawa’s support for Israel in isolation. That support should not be divorced from a wider foreign-policy discussion. The Palestinian solidarity movement needs to make its critique of Canadian foreign-policy more explicit. We should “de-ethnicize” the conflict. This is not an Arab or Jewish issue but rather one of global importance about basic human dignity. This article first appeared in Canadian Dimension. Comments Off on What explains Harper’s slavish support for Israel?